How do you repurpose an old trailer park and a long backyard? Senior Living! 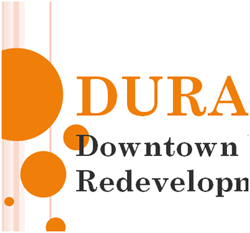 In late 2012 and early 2013, DDA assembled two narrow tracts to create a development site on Fifth Street for a large-scale structure in the W. Washington St. Gateway (behind the modestly-scaled historic structures lining W. Jefferson Street). Parallel Housing, Inc. and The Woda Group, Inc. acquired the new 3-acre tract to construct 44 units of affordable senior housing, a $6.5M investment in the W. Washington St. Gateway. Designed to meet our historic district standards, these lovely apartments follow the pattern set by early 20th century courtyard architecture.